I recently attended a reception at which hors d'oeuvres were offered. When the server approached us with her tray, my companion took one, and it looked so delicious that I did the same. It was a generous two-bite size. Accidents can’t be avoided. But they can be anticipated. Enjoying the first bite of that appetizer and being mindful to eat the second bite as soon as the first was finished, could have helped me escape an awkward moment. Below are other tidbits to help get us through the cocktail hour or reception event unscathed. Appetizer food tables are fun to explore. You never know what you may pick up to eat - or what new ideas you will hear when you visit with others mingling at a stand-up event. DON’T decide just to skip the food, as others will be nibbling and everyone likes company with hors d'oeuvres. DO choose something that meets with the minimum and that you can enjoy — or that it appears as if it's waiting on your plate to be enjoyed. DON’T forget to pick up a cocktail napkin, as you will need to wipe your fingers and dab your lips. 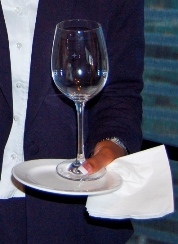 DO use the napkin if your right hand gets wet from holding a glass that may have water on the outside of it. People you meet and shake hands with will appreciate your dry handshake. DON’T use your hands to pick up nuts, chips, or popcorn. DO use the spoons or tongs provided for the common bowls to scoop the morsels onto your appetizer plate. DON’T leave shrimp ends, skewer sticks, toothpicks or any trash on the serving table. DO find an appropriate receptacle! If you are moving immediately to dinner, be sure to leave behind your glass, appetizer plates, etc. on a table most likely provided. When servers whisk around the room to offer goodies from their trays, feel free to indulge. But when your only prop is a napkin, the balancing act can become a little trickier. DO feel free to pass on an appetizer if it looks difficult to handle (greasy, cheesy, or slimy). 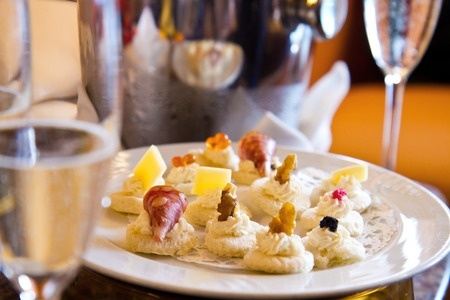 DON’T accept more than one served hors d'oeuvres at a time. DO show your interest in the conversation you're involved in. DON’T waive your appetizer around when talking. DO enjoy and appreciate the items served. DON’T appear hungry or wolf your food down ravenously. Even if you are almost finished with your appetizer, pass on accepting another until you’ve finished it. DO think about what you would do if you were hosting. Have you noticed that the crumbly, sauce-laden, skewered tasty treats are best served from an appetizer table? This is where things get interesting. You have a drink, you have hors d'oeuvres, and you have someone to talk to. 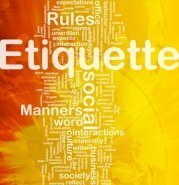 I learned this savvy solution from my first etiquette teacher, Peggy Newfield, of the American School of Protocol. Now, how do you manage it all at once? Napkin: place a tip between your ring finger and middle finger. Plate: hold between the middle finger and index finger. Glass: your thumb and index finger will securely hold the wine glass at the base (some people prefer to secure the glass with the thumb alone). Move the glass from your left hand to your mouth and drink; replace the glass in your left hand as instructed above. Pick up the tasty tidbits from your plate and eat. Wipe your fingers on your napkin. Extend for a handshake while smiling and greeting other people. Keep your plate close to your waist, elbow close to your body. Your right hand will take the food from your waist to your face. Observe your bite site. No one wants to see you chewing and talking at the same time. You’ll feel less awkward if your bites are reasonably sized. If food drops from your plate, though you might not be the one who picks it up, make sure you take care of it so that no one slips or gets food on his shoe. Everyone appreciates a clean floor. Always remain courteous to other guests, as anyone can make a faux pas. Sometimes a little dash of kind humor will lighten things up. Mix and mingle! The goal of any pre-dinner cocktail party or reception is to move about and meet and greet people whom you haven’t met as well as to say hello to people you know. Thank the host and offer a kind remark about the food. Hosting is not always an easy task and deserves recognition.